Boil potatoes, cool for a while, peel then mash it and keep aside. In a blender, coarsely ground ginger and green chilli and keep ready. Heat oil in a kadai, when its heated add cumin seeds wait till splutter, then add hing ground ginger-chilli and fry well. After that add methi leaves, sprinkle salt and sugar, stir fry for a minute. Then add mashed potato, turmeric powder, enough salt and mix well and fry for a minute. And add cumin powder and give a nice stir and finally add shredded carrot and squeeze lemon juice, stir well and switch off the stove. That's it..Aloo Methi stuffing is ready..allow to cool completely. Once it is cooled completely, then divide into 7 lemon sized balls and keep aside. 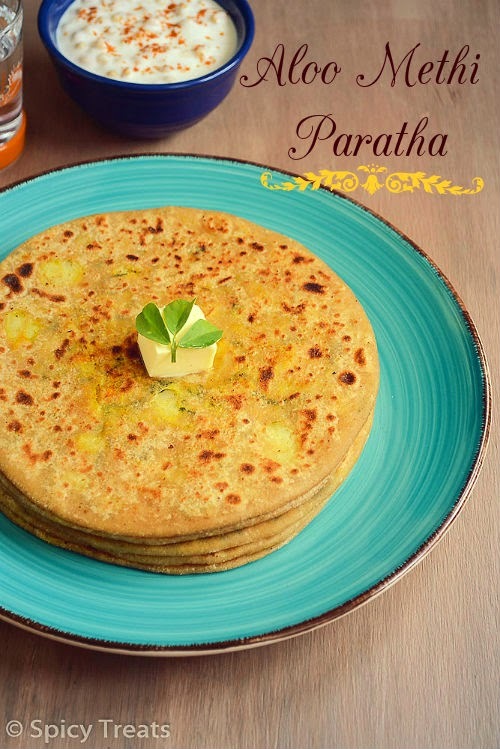 Heat tawa/griddle,fry the parathas on both sides till turn light golden brown...drizzle some oil on all around the parathas while toasting. 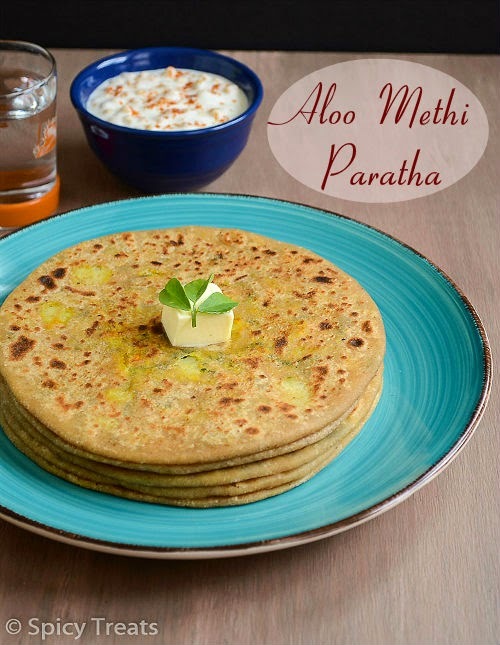 After that remove from the tawa, Aloo Methi Paratha is now ready and serve hot with plain yogurt and Mango Pickle. This is off to Priya's Shh Cooking Secretly Challenge. Adding carrot is optional but sure makes it even more colorful and delicious. Instead of green chilli you can also use chilli powder. You can also skip lemon juice and add amchur powder. As i was concentrating with the round shape paratha i completely forgot to take the pictures of stuffing and rolling...will update it later. 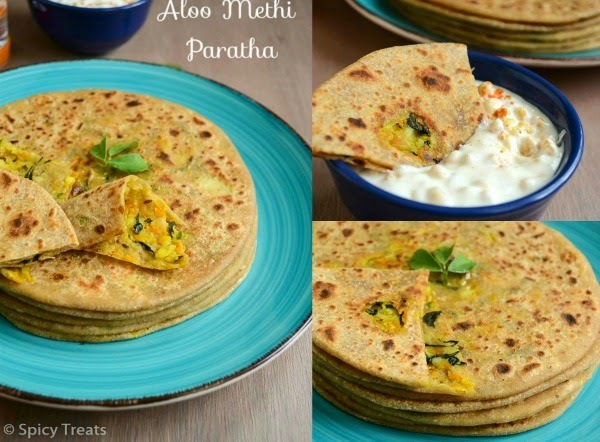 aloo and methi in paratha.. yumm.. yumm.. 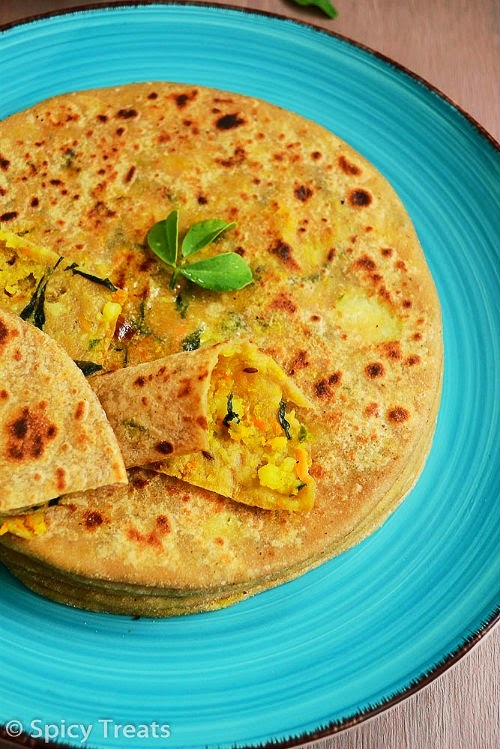 Delicious healthy paratha....... Yummy platter!! flavorful n healthy ones dear,looks a filling dinner..yummy ones !! such an tempting paratha and well use of the screte ingredients into the filling :) just perfectly made and stacked :) I want them now !! Lovely Presentation ...my fav looks delicious! yes sangee u got a perfect shape paratha,...looks inviting!! 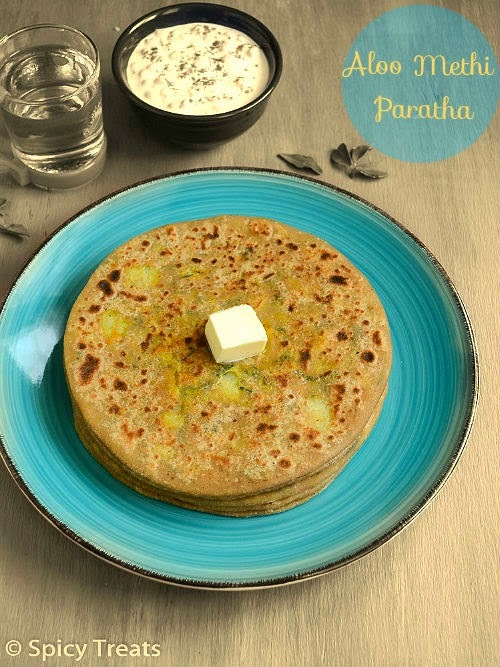 You nailed those stuffed parathas prefectly, prefectly stuffed and prefectly shaped. Tried this for yesterday's dinner. Came out really tasty. Thanks, Sangeetha! Ohh..Also you might have over cooked the potatoes, too much soft and mushy potatoes also gives moisture and you cannot stuff and roll neatly. So next time, try boiling the potatoes to right texture and try it. Hi, Thank you for your interest. Please click on the orange icon on the top right corner to subscribe or follow by email to get recent updates.